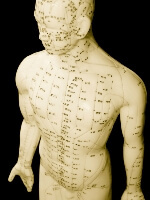 Acupuncture is the ancient Chinese art of healing using very fine needles placed in specific points on the body. It has been used in China since at least 2000 BC. It can be used for a wide variety of illnesses, including asthma, insomnia and headache, among others. Acupuncture is based on the theory that energy circulates throughout the body in channels and its flow can be influenced by needling the acupuncture points. Bringing the flow of energy into balance brings a sense of well-being and can relieve pain and other symptoms. Western scientists are working today to elucidate the mechanism by which acupuncture achieves its results. Chinese medicine uses a number of modalities, of which acupuncture is one. Another is Chinese herbal medicine, which JoAnn uses as an adjunct to acupuncture or on its own. The practice of nutrition is also an integral part of the services JoAnn offers to her clients. She integrates all aspects of her training to provide all clients with a unique care plan designed to bring them to balance and health. Please call to find out what discounts are available for carriers of certain insurance plans. Copyright © 2019 Simon Acupuncture and Nutrition. All Rights Reserved.